» Ready for a ‘Back to the Future’ Stage Musical? 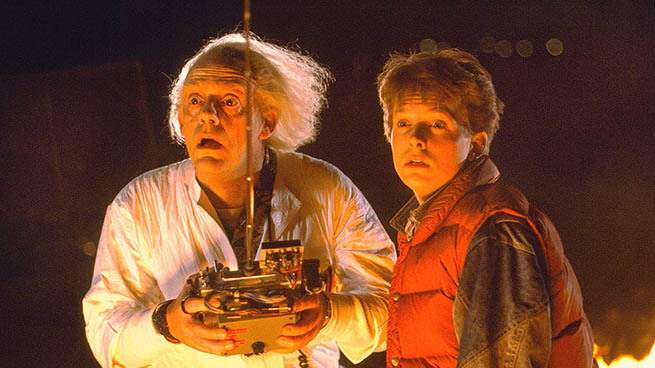 Ready for a ‘Back to the Future’ Stage Musical? Series producer and screenwriter Bob Gale confirms it, folks: Back to the Future is being developed as a London West End musical, and Robert Zemeckis is cowriting the book. “The Power of Love” and “Johnny B. Goode” will show up alongside original music, and there shall be skateboarding. The show should premiere in 2015, which happens to be the year Back to the Future Part II first gave us a glimpse of. André 3000’s Jimi Hendrix biopic, All Is by My Side, will premiere at SXSW in March. Boardwalk Empire’s Michael Pitt is coming to NBC’s Hannibal. Matthew McConaughey and Amy Adams have Inside the Actors Studio episodes coming in February. Helen Mirren + twerking = this. Bill Hader may costar with Amy Schumer in Judd Apatow’s Trainwreck. Here’s a new promo for The Tonight Show Starring Jimmy Fallon. American Horror Story almost doubled its viewership from the Season 2 finale to last night’s Season 3 finale, pulling 4.2 million viewers. This lady has a knee that looks like Kanye West, your guess is as good as ours as to how anybody noticed it. Tara Reid gets to keep acting! And in case you missed it: There’s a version of Beyoncé’s Grammys performance of “Drunk in Love” set only to piano. It’s wonderful. Have a fun weekend, lovestruck drunkards.